Europe would lose its spiritual and cultural identity without its nations, Hungarian Prime Minister Viktor Orban told his audience at a European People’s Party (EPP) congress in Helsinki on Thursday. “Europe will either be a Europe of nations or it will cease to exist,” Orban noted ahead of a vote on the lead candidate for the post of European Commission president. He said the continent’s strength has always been based on strong nations. The “accession of central European nations have made Europe more peaceful, stronger and richer”, he added. Orban accused liberals, socialists and greens of wanting a rootless Europe devoid of its spiritual and psychological identity. “Our vision is a Europe with 27 faces, one that is both Christian and democratic,” he said. Orban said the EPP was still “a party of victors” because it preferred realism rather than championing world-redeeming ideologies. “To return to the path to victory”, the EPP should restore its unity, find its roots again and proclaim the “renaissance of Christian democracy”, the prime minister said. “Absurdities like praising Fidel Castro or Karl Marx should be forgotten,” he added. Orban warned that the EPP should not heed its adversaries and should not accept the standards of the left and the liberal media, he said. “If we try to live up to their expectations, we are doomed to fail,” he said. The key to success is to take the side of the people, Orban said. “Let’s protect them from illegal migration, terrorism, crime and economic hardship,” he said. “Let us once again put the old slogan on the banner: [a government] of the people, by the people, for the people”. The prime minister emphasised that the EPP should build on its successes. “Those who do not value their victors deserve failure,” he said. As the European elections are won in the member states, “the EPP as a victors’ party needs victorious prime ministers,” he said. Orban said that ruling Fidesz backed Manfred Weber, EPP’s incumbent parliamentary leader, as lead candidate for EC president. He thanked Weber for visiting Hungary during its election campaign earlier this year. “We respect you as a man who knows when it is time for controversy and when for unity,” he said. Orban reminded his audience that this week on Friday will be the anniversary of the fall of the Berlin Wall. “We, the states thrown into the claws of the Soviet Union, knew that we could only regain our freedom in a united Europe,” he said. The Fidesz party was born in the fight for that reunification, in 1988, and invited to the European People’s Party by German Chancellor Helmut Kohl, “who understood that members of a family are always united, even if they disagree,” Orban said. Orban told Kosuth Radio in an interview after the congress that “it had not been difficult” to decide whom to support of the two candidates. 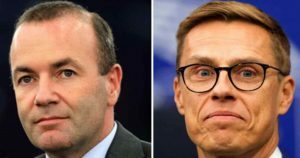 He called Alexander Stubb (pictured right) an “extremely liberal, pro-migration politician” while he said Manfred Weber (pictured left) was a Christian Democrat. “After a century that saw two world wars that wrought catastrophic damage, and a half century of communism that attempted to erase our national identity, Hungary makes no apology for putting cultural preservation among our top priorities”, Kovacs’s letter reads.